The destroyer Hamakaze, which means "beach wind," was part of the tokkō (special attack) fleet of ten ships led by the battleship Yamato toward Okinawa. On April 7, 1945, Hamakaze, battleship Yamato, light cruiser Yahagi, and three other destroyers were sunk by bombs and torpedoes dropped from attacking American aircraft between Kyushu and Okinawa. Kure Naval Cemetery was established in 1890. After the end of WWII with the dissolution of the Imperial Japanese Navy, the cemetery was preserved as part of Nagasako Park. The park has about 90 monuments erected after the end of the Pacific War to remember men who died in battle. The Battleship Yamato War Dead Monument stands at the front of the park. The listing above illustrates that the destroyer Hamakaze, after being built at the Uraga Dock Company in Kanagawa Prefecture and commissioned on June 30,1941, fought from the beginning of WWII until nearly the end. When the battleship Musashi sank during the Battle of Leyte Gulf on October 24, 1944, after being hit by torpedoes and bombs from American aircraft, the destroyer Hamakaze picked up and brought on board 904 of the ship's 1,390 survivors. Hamakaze was one of 19 Kagero-class destroyers. Two other Kagero-class destroyers, Isokaze and Yukikaze, were also part of the special attack mission led by the battleship Yamato. Nagasako Park also has a monument to remember the war dead of Destroyer Division 17, which included the destroyers Tanikaze, Urakaze, Hamakaze, Isokaze, Yukikaze, and Hatsushimo. Along with Hamakaze, three other Destroyer Division 17 ships (e.g., Isokaze, Yukikaze, and Hatsushimo) were part of the tokko (special attack) force led by the battleship Yamato toward Okinawa. Isokaze and Hamakaze sank during the special attack operation, but Yukikaze and Hatsushimo survived and picked up survivors from the battleship Yamato and the other ships that sank. On June 9, 1944, the destroyer Tanikaze sank and lost 114 crewmen when torpedoed by an American submarine. On November 21, 1944, Urakaze was torpedoed by an American submarine and lost 228 men when the ship exploded. 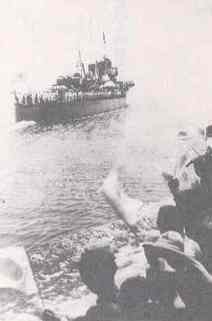 There were 256 Hamakaze crewmen who were rescued from the sea by the destroyer Hatsushimo several hours after the Hamakaze sank. Abe (2005) gives three different times for when Hamakaze split in two and sank (p. 47 - 12:58 p.m., p. 129 - 1:51 p.m., p. 141 - 12:59 p.m.) with no explanation for the discrepancies. The battleship Yamato sank at 2:23 p.m.
1. 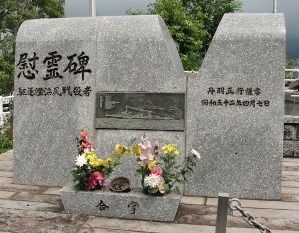 The monument's plaque mistakenly has 25-cm and 13-cm for Hamakaze's machine guns rather than 25-mm and 13-mm. Abe, Saburō. 2005. Tokkō Yamato Kantai (Yamato Special Attack Fleet). Tokyo: Kojinsha.